A relentless public servant for more than 40 years, Senator Panfilo Morena "Ping" Lacson has compiled a solid record against wrongdoing, in line with his personal credo: What is right must be kept right; what is wrong must be set right. Lacson is an untiring, tenacious watchdog of the national budget, making sure dubious congressional insertions (pork barrel) and useless appropriations are checked and deleted during plenary debates. Way before the multibillion-peso scam involving Janet Lim-Napoles exploded in 2013, Lacson already detailed in a March 2003 privilege speech the temptations for officials to pocket taxpayers’ money. He also had his PhP200-million-a-year PDAF allocations returned to the National Treasury, saving government PhP2.4 billion in 12 years. Because of his continuous fight against corruption, including pork barrel in all its iterations, the Pamantasan ng Lungsod ng Maynila conferred on him the degree of Doctor of Laws, Honoris Causa, on March 27, 2019. In the 17th Congress, Lacson was the principal sponsor of the National ID system law (Republic Act 11055), which provides for easier transactions with the government and private entities and which helps deter criminality. Lacson had been a perennial author of the measure since his first term as senator in 2001. Lacson sponsored Senate Bill 1898, which boosts the Philippine National Police's internal cleansing efforts by transferring the training of police recruits from the Philippine Public Safety College to the PNP. Also, he filed Senate Bill 1956, The Anti-Terrorism Act of 2018, to update and enhance the Human Security Act of 2007. * Senate Bill 42: penalizing a wide range of heinous crimes ranging from drug-related offenses to treason, terrorism and human trafficking. Lacson was one of the main authors of the Reproductive Health Act, and the Sin Tax Reform Act. His Senate Bill No. 2783, which strengthened further the Anti-Money Laundering Act of 2001, is now part of Republic Act No. 10167. Lacson also authored a key amendment to the Armed Forces of the Philippines Modernization Act. 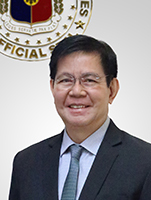 Before the Senate, Lacson served in the Philippine National Police, heading it from 1999 to 2001. He had 85 percent of resources go to frontline units, and imposed a 34-inch waistline limit for police officers. More importantly, Lacson led by example, refusing bribes and declining “rewards” from rescued kidnap-for-ransom victims. Under Lacson, the PNP – and Lacson – scored very high approval ratings. Lacson also served as Presidential Assistant for Rehabilitation and Recovery, coordinating efforts to help victims of Super Typhoon Yolanda.